Live streaming coverage of the Steel City National begins Saturday, September 1 at 1pm ET. The best motocross riders in the world are back at it again as the Lucas Oil Pro Motocross Championship continues on Saturday with the FMF Steel City National in Delmont, PA. The event will get going at 1pm ET and motocross fans will be able to watch it live online for free, thanks to various online streams. Visit FreeCast’s Live Events page to start watching the Steel City National live online as soon the riders hit the track. Steel City Raceway is highly regarded as one of the top motocross tracks in the Lucas Oil Pro Motocross Championship series. It features huge berms, deep braking bumps, and off-camber turns and is laid out in a valley, which makes it easier for racing fans to watch all the action from the sidelines. 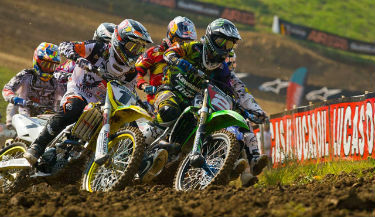 Watch the 2012 Steel City National live online for free when the best motocross riders in the world battle it out on the track. Some big motocross riders to watch out for in the Steel City National, which will be streaming live online for free on Saturday, include Mike Alessi, Blake Baggett, Justin Barcia, Marvin Musquin and Ryan Dungey, who has won 14 of the last 16 motos and it currently at the top of AMA Motocross standings. Dungey has never won at Steel City Raceway in the premier division but was extremely close last year before Ryan Villopoto executed a last-turn pass to claim the vicory. Watch the Steel City National online live for free as Dungey tries to take home the crown this time around at Steel City Raceway. Steel City Raceway has become famous for hosting some of the most intense motocross races since it became part of the Lucas Oil Pro Motocross Championship series in 1989. The Steel City National is the second of two rounds held in Pennsylvania this year and is the second-to-last Lucas Oil Motocross Championship event in 2012. Be sure to watch the 2012 Steel City National live online, absolutely free to see some of the best, most gripping motocross action of the year. All you have to do to watch the Steel City National online live for free is visit FreeCast’s Live Events page where you will find direct links to all the exciting motocross action. You can also watch the Steel City National live online for free with your tablet or mobile device if you find yourself without a computer.